A man gave nine artists free reign of the house with one stipulation: they had to create art inside using only things found in the home. This is an outside view of the home’s stripped-down facade. The project called "3020 Laguna Street in Exitum" will be open to the public on Saturday. There’s a certain house in San Francisco’s Cow Hollow Neighborhood. It’s not a particularly memorable home. But it is pretty old. It was built in the 1870s, and has withstood more than 140 years of remodel jobs. But its final facelift will certainly be its most dramatic. Two years ago, Amir Mortazavi got access to the house at 3020 Laguna. 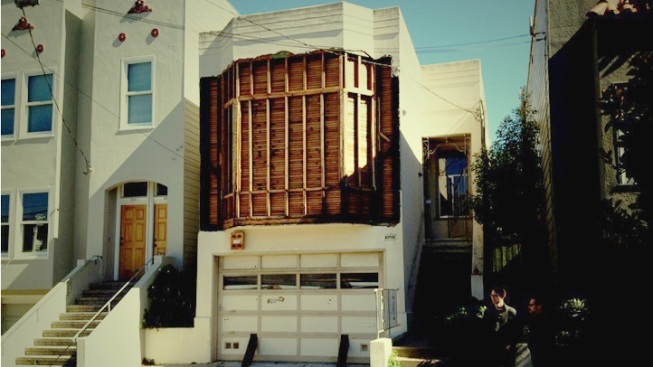 Mortazavi, a San Francisco real estate developer and art gallery owner, said the owners planned to demolish the home and replace it with a new one. But before its date with the wrecking ball, Mortazavi envisioned one last chapter in the home’s long history. Mortazavi gave nine artists free reign of the house with one stipulation: they had to create art inside using only things found in the home. Artist Chris Fraser stripped the front of the home down to its wood slats. He removed three windows and replaced them with more wood. Inside the front room he painted stark white, light spills through the slats creating a ballet of dancing projections. In the kitchen an artist carved a labyrinth in the linoleum. In a hallway, Artist Andy Vogt created a subfloor, almost like a wooden moat meandering toward a doorless doorway to nowhere. In the basement, Yulia Pinkusevich stripped the home’s wiring of its casing and then fashioned it into a colorful sculpture. Schlesinger lived in the home for 28 days, becoming its final occupant before it’s torn down next month. He occupied a 10 by 12-foot room, fashioning furniture from base board and door frames. He even made a plaster cast of one of the home’s Victorian doors and hung it in his room. But any nostalgia for the home is tempered by the fact it will continue on in the art. Organizers of the project have photographed and videotaped the work and opened the home to visitors. “This house otherwise probably would’ve only existed through blueprints in the city archives,” said David Kasprzak, who curated the project. The home will open this Saturday for the public from 2 p.m. – 7 p.m.